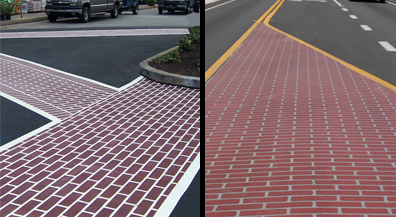 TrafficPatterns® is a durable preformed thermoplastic pavement marking material used primarily for streetscape and traffic calming purposes on public roads and private properties. TrafficPatterns® provides a cost-effective alternative to the use of brick and stone pavers because the material is surface applied and virtually maintenance free. Available in 90-mil and 125-mil thicknesses, the 2 ft. x 3 ft. sheets of interconnected material are easily lifted and positioned onto an asphalt or concrete surface for application with a propane heat torch or large heater. Engineered with safety, durability and aesthetics in mind.